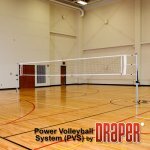 Draper offers some of the best indoor volleyball equipment standards in the game today. 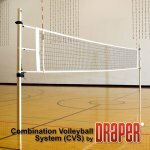 Sturdy, dependable and EZ setup systems that have made Draper the choice of athletic directors outfitting their gymnasium. Single and Double Court Systems available. All-Aluminum w/PVS floor-sleeve engineered for a lifetime of hard use. Single and Double Court Systems adjustable height for tennis,badminton and volleyball. 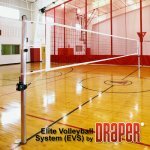 The Elite Volleyball System is Draper’s top of the line volleyball system, for today’s premier volleyball programs. 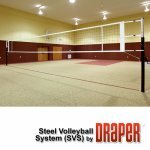 Has all the same great features as our power volleyball system but is made of steel instead of aluminum.